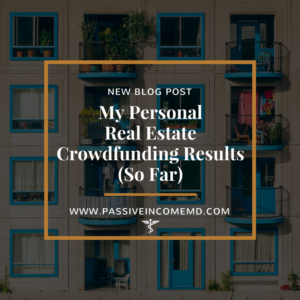 My Personal Real Estate Crowdfunding Results (So Far) | Passive Income M.D. Back in 2014, I started going to local real estate investor meetings to learn from and network with seasoned investors. It was at once such meeting where I was introduced to a “new way” to invest in real estate known as crowdfunding. They explained that under new regulations, investors could now have access to so many more deals online and would be able to invest with significantly lower minimums. Having no prior experience in real estate investing, that all sounded really appealing. At that same meeting, I met one of the founders of a crowdfunding site, and we talked at length about how it all worked. I was able to dip my toes into real estate investing without putting too much capital at risk, and I know that this first step acted as a springboard to ultimately owning my own rental properties. It’s been a great source of passive income and the returns are attractive enough that I continue to invest today. You can see a list of my favorite crowdfunding sites here. Note: I’ve invested in 13 deals and one fund so far. I invested a sizeable amount in the fund nearly a year ago, but I haven’t seen a return or distribution yet. This is due to an initial onboarding and repositioning period. Therefore, I won’t be reporting the results of the fund for now. Debt or Equity – I like to mix it up in terms of debt and equity deals. As you can see I’ve invested in 7 debt deals & 6 equity deals. Debt deals receive a predetermined interest return over the length of the loan, whereas the equity deals receive interest during the term as well as a payout when the property is sold. Expected Return – APR or IRR expected. Debt deals are pretty clear. For equity deals, they add in the interest rate that they will pay you over the term plus what they expect your share of the payout will be when the deal exits to calculate expected return. Issues – A few deals experienced unexpected issues such as a tenant not paying rent and permitting issues. However, the platforms dealt with this and fortunately were able to resolve these issues. The deals have had adjusted times but at the very least I’ve received some interest while my money was being held. Difficulty – I’ve found that this form of investing is extremely passive and the initial setup isn’t difficult. The biggest challenge is trying to vet the deals quickly before they fill. That’s why it helps to be alerted when new deals come up so you have to the most time to review them. At the end of the day though, some trust is required in the platforms themselves. That’s why I stick to ones I’m familiar with. Other Challenges – When a deal exits, you feel the need to reinvest those funds right away. If you’re looking across multiple platforms, at least you should have access to a good amount of deal flow. However, I’ve had to tell myself to be patient and not just jump at any deal because I want to put those funds to use. Risks & Other Notes – These are my personal results and no guarantee of results for anyone else investing. In fact, they’re not even a predictor of future results for myself and I understand that. This type of investing, like any form of investing, is not without risk. However, I now feel relatively comfortable looking at deals on these platforms but that has come with experience. Future – I plan on continuing to invest in real estate crowdfunding and in a good mix of debt & equity deals. I’ve worked outside of these platforms with syndicators in the past, but there’s a comfort knowing that if things don’t go well, that there is a company that will help me in that scenario. Care to share some of your own results? I haven’t made the plunge yet. I am glad you share your experiences though. What tax forms do they send you? I invested in a senior living development company. It returned the expected 25% on a 100K investment which was super, but I had a very late K-1 and I had to file state taxes in 4 states – not so fun. Also, what would happen to these in a 2007-2008 financial environment? Hi Jeff, thanks for stopping by and sharing your experience! Can you discuss the tax implications of using a site like equity-multiple for instance, in which each investment might be in a different state vs alpha flow that issues a single K1 statement yearly? I like those returns and am happy to see you’ve had success. Unfortunately, the taxation of these returns is not favorable, and the need to file additional state taxes is a bit worrisome, as well. Have you given any thought to making these investments within a self-directed Roth IRA? That would alleviate my two biggest concerns with these investments. I actually had this very discussion recently with my CPA. I’m learning the intricacies of the tax issues with these investments and will report back shortly. I’ve been fortunate that the majority of my equity deals have been within my home state making the filings a little easier. There are some pass-through tax benefits with these equity deals in the form of depreciation and business expenses that improve the bottom line on these returns. At the end of the day, if the investments are solid, and I get a good return, I understand there will be some taxes to pay. As I’m approaching your level of financial independence, taxes are definitely more on the mind. In the future, I’ll be using both tax-advantaged and non-advantaged money. I definitely give the tax burden some consideration, but I haven’t let that keep me from investing. Nice going. I too learned about Crowdfunding at a RE Investors Meeting. Started less than 1 yr. ago and average 10.3%. Keep up the good work! P.S. I finished my first renovation project and I am not doing that again! Sometimes I had more stress then practicing medicine. That’s a great return. We’ll see how things hold up in a downturn, same can be said about the stock market I guess. Renovation in terms of fix and flip? Definitely not a passive income pursuit in any ways but a side gig that some really enjoy. Very great article this might help me having my own property. I’ve learned a lot, thanks for sharing this and congrat for your success. Is it possible to crowd invest in real estate via an IRA? Thinking about the taxes. I’m a small investor making under 50,000/yr. Very interesting. My feeling on this is if I am going to take the time to “learn” real estate, I might as well jump right in and buy property directly. If I just want to passively get involved in real estate and not spend much time on it, I’m better off putting my money in index funds. I like to do it all. It just takes a little more capital to personally invest, so that can limit my ability to just jump in and get another property. I like the returns from crowdfunding and like the fact that it’s collateralized debt. Don’t get me wrong, I still put some money in index funds, but I like to diversify outside of the stock market. Thanks for stopping by! Hello. Thank you for writing this up. For the 13 deals, could you also list what site they were from? I would also like to see a breakout of site, similar to how you did P2P platforms. I am new to crowdfunding but am concerned about the taxation too.. has anyone figured that out yet? It can get a little complicated. Instead of writing you a huge reply here, I’m going to direct you to a post on the issue that should be out in a week or two (and post the link here when it’s up). Thanks for being patient! – Are you using tax-advantaged/ non or both? – I personally have a defined benefit pension plan and wondering if that can be the source? (Waiting to hear back from the plan administrator). Seems that would be more beneficial considering the fees involved in setting up a SD IRA with the associated transaction costs which seem quite high. Thank you for your efforts to help us understand crowdfunding from your own experiences. What percent of the investment amount is spent on administrative costs(management, legal, accounting fees)? Are all platforms relatively the same percent of investment costs? Have we figured out the taxation and what is your current portfolio with crowdfunding? Crowdfunding is becoming a bigger trend as of late. Initially, I split my money between 2 companies. The 1 company that I was told is one of the best, now has a very poor scoreboard, so I am funneling my money (as the loans come due) into the second company which is doing much better. In fact, 1 of my investments in the first company is a mess and is going to foreclosure and has a lawsuit against a title company! 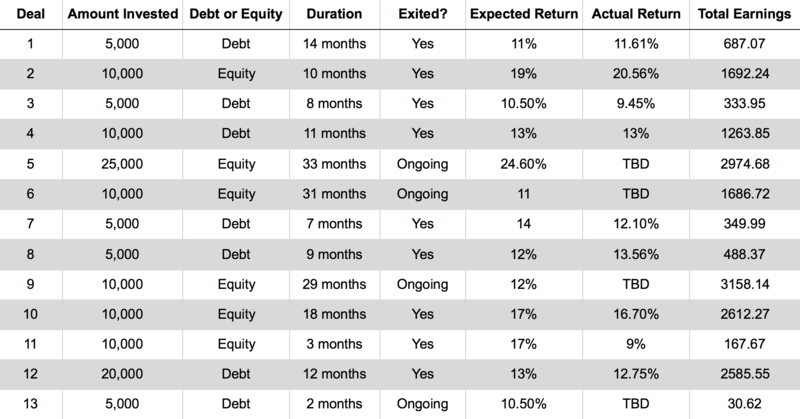 Where are you finding debt investments with returns of greater than 12%? 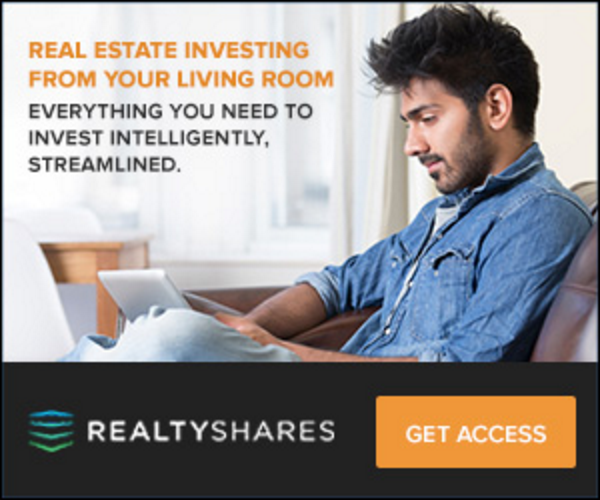 Most of what I’ve seen on your recommended sites (Realtyshares, PeerStreet, Equitymultiple, etc.) have rates of 7-10%. Can’t say I’ve ever come across a 14% yield on a debt investment. Gone are those days. They were around in the early days of crowdfunding. Yes, it’s now more common with debt deals to see 7-10%. Can you share your due diligence process with us to give us an idea where to start? As above, everyone talks about ‘due diligence’, but not many inform novices like me how to do it. I read the CrowdStreet e-book (all 150+ pages) and learned a lot of general information. However, I wonder if you have some words of advice on vetting opportunities? Rates now are 8.5% to 9.5%.